Following our trip to Yona, my Chinese teacher’s, village wedding, I’ve engaged in more conversations with her about what life was like there as a young girl growing up. Yona is unreservedly positive about her childhood, despite its hardships. She enjoyed the freedom of playing in the stream and the forests, even if she had to cycle to primary school in a neighbouring village, starting out in winter in the dark before 7am and sometimes crashing into the bamboo at the side of the road. Her grandmother’s house of course had no heating, but Yona remembers the portable bucket fires still prevalent in rural China with nostalgia. She described something like a hot water bottle which she assured me kept her warm all night. Personal hygiene was a whole other story. Once a week she also cycled to another village for a shower in the public bathhouse. The public toilets which I’d found difficult because of their lack of privacy – no individual cubicles – are apparently a great improvement on ten years ago. Then the toilet block opened straight onto the street, and passers-by greeted you while you excreted or urinated. At least now the entrance faces away from the street. But what fascinated me was the fact that Yona’s grandmother still doesn’t have a bathroom in her house. She could have one, but prefers to use the public toilets. In the same way she has not installed a bottled-gas hob, preferring to cook using an open fire. She doesn’t want to live in Ningbo with her son, as is the custom, and considers city life to be utterly boring. Nevertheless, she may soon have to move as the authorities have deemed the village unsafe and have decided to close it down. Another reason for not wanting to live in the city is the deteriorating environment, caused by the relentless construction of new buildings and the plethora of local factories. 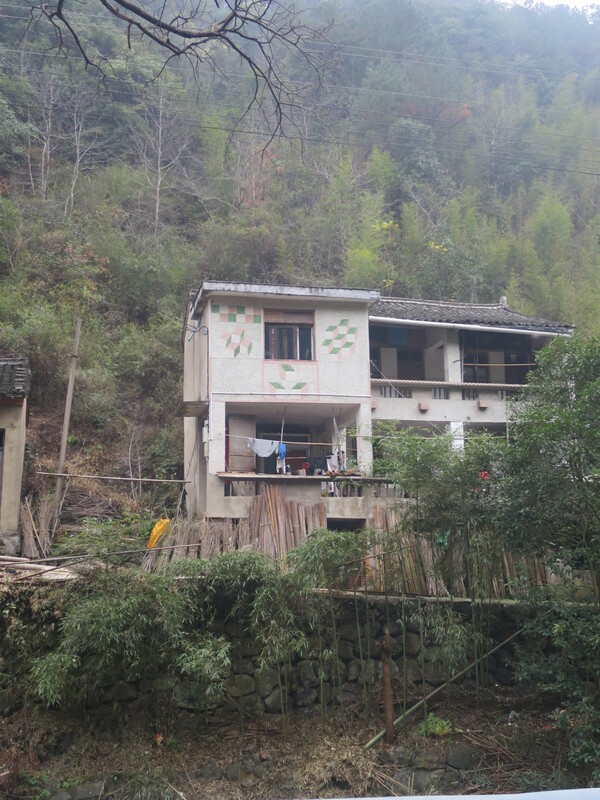 Although we have two bathrooms, access to hot water, electric heaters and other home comforts, the air we breathe is dirty, and I can quite understand why Yona’s grandmother might like to stay in her mountain village. When I was in the sixth form back in the 1960s I remember my geography teacher describing how she used to sweep the soot off her front step in Sheffield, before the 1956 Clean Air Act. I don’t remember the word ‘pollution’ ever being used, and I certainly couldn’t have known that 45 years later I’d be experiencing a similar phenomenon. I’ve never thought so much about cleaning as I do here. It is a daily battle to fight off the fine layer of grey brown dirt which coats every surface. The contents of our small vacuum cleaner look as though we actually live in the nearby construction site and we’ve already had to ask Alice to buy new filters for the vacuum from Taobao. Our windows always look dirty, despite regular cleaning, and the expandable bars for hanging out washing need to be wiped down repeatedly. I’ve begun to doubt the wisdom of hanging washing outside as clothes must come in dirtier than they went out. We have recently been overtaken by fits of violent sneezing and coughing, especially at night or in the early morning. The symptoms are close to hayfever. It seems that after two and a half years our systems no longer have any resistance to the relentlessly dirty air and I’d begun to fear that I would permanently damage my eyes. So last weekend we decided to buy one of the many types of domestic electric air purifiers available in Metro. One of the many non-jobs to be found in Ningbo is carried out by the man in uniform who waits by the exit of Metro, ready to stamp the invoice issued at the checkout. The man is invariably friendly and looking for a chat and we provided amusement for him when we tested our newly bought air purifier, just near the exit. Metro provides a ‘test platform’ to allow you to make sure that electrical appliances operate before you take them out of the shop. ‘What is this?’ asked Invoice Stamp Man, as we struggled with the box. One of the first words I learned in Chinese was ‘pollution’ and I was able to construct some kind of explanation along the lines of ‘make the air clean’. ISM looked sceptical to put it mildly and if he’d seen the price – around 2,500 RMB or £250 (probably around one third of his annual salary) he would doubtless have thought foreigners were truly mad. But perhaps he too remembered his village childhood where conditions may have been harsh, but at least you didn’t need to worry about the air you breathed. Towards the end of the feast, the father of Yona, the bride, cigarette in mouth, gave out big red party bags for every guest. These contained a large box of Ferrero Rocher chocolates and two round ‘double happiness’ sesame cakes, offering 100 years of happiness. This gesture summed up the mixture of new and old embedded in the village wedding celebration. 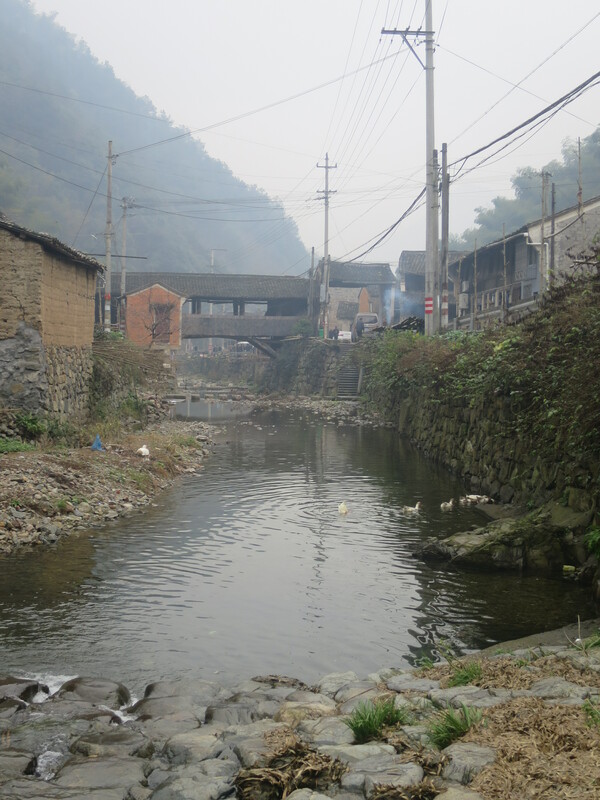 The lunch we attended was in a small village, high up in the mountains about 40 miles south of Ningbo. To reach it we drove past rice fields and the seemingly endless edge-of-development mess which is to be found outside the city and around the nearest town, Fenghua. While east coast cities and towns are showered with infrastructure and connected by new highways, rural villages receive little investment. Young people leave in droves, and only the elderly or the very young remain. The village has one main street, running beside a small, but deep river valley, crossed by a picturesque covered wooden bridge. Some of the houses are brick built, but most are wooden, gathered around courtyards with small, neat vegetable gardens adjacent to the street. If the public toilets are anything to go by, plumbing is primitive. By the time we arrived, the main street was already incongruously lined with gleaming black BMWs, including the bridal SUV complete with a heart-shaped design of red roses on the bonnet. The lunch was the traditional feast given by the bride’s family before the groom takes her off to his village – in this case some two or three hours away. Most of the local inhabitants were at the meal, which began around 11am, and neither they nor the bride’s family would attend the evening banquet arranged by the groom’s family. Yona had spent the night in her paternal grandmother’s house at the bottom of the village, reached across an ancient arched stone bridge. She had been brought up here by her grandmother and lived in the village until she was 16. Once the groom answered riddles and passed tests set by friends, he led her to the ancestral community hall, further up the street. This was a cement floored, wooden shelter, open on one side, with stone wood-burning stoves for cooking. About ten tables accommodated 100 guests, all seated on wooden stools. We sat on the foreigners table along with eight or nine other of Yona’s students, the focus of much friendly staring from the locals. Although it wasn’t cold by the standards of a Chinese winter in the mountains, as is usual in south China, everyone kept their coats on, except, that is for the poor bride, who wore a sleeveless, white dress of tuile. Yona, who is my Chinese teacher, had been telling me for weeks that she was afraid of the cold and we had come up with various plans for keeping her warm. She was reluctant to wear the western style wedding dress, reflecting that it was out of keeping with the rustic setting of the lunch, but she told me that her parents wanted it, along with the photo shoot which had happened a few weeks before. In the evening she would wear a somewhat warmer, traditional red costume, which was more to her liking. In addition to the status of the wedding cars and the wedding dress, there was clearly much ‘face’ in the sheer quantity of the food served at the lunch. Cold starters of jellyfish, nuts, pickled bamboo shoots, hairy crab and crayfish, were followed by steaming bowls of pork knuckle, mushroom and pork mince soups, steamed fish, fried fish and chilli, duck, and steamed greens. I sensed that the foreigners table was deemed to have not done the food sufficient justice as a few old locals kept asking us why we hadn’t eaten more. We had all learned to say ‘I’m full’ in Chinese courtesy of Yona, but I think this was seen as a feeble excuse for only eating about one third of the food, and as the villagers spoke local dialect, and not ‘standard’ Chinese, they may not have understood anything we said. About 12.45pm it was all over. The bride and groom had visited and drunk a toast at each table (there was plentiful wine and ‘baijiu’ or white spirit for those that wanted it) and collected the traditional ‘hong bao’ or red envelopes of money proffered by their guests and containing yuan in multiples of lucky numbers 6 or 8. The bride gathered up her skirts, revealing strong ankle boots, thoroughly practical given the environment, and quite rebellious in the circumstances, and marched down the main street back to her grandmother’s house and thence the wedding car, ready to drive for three hours to the second feast. Some guests on our table were going to take the train to the next venue, for apparently only one hour. As older guests, we summoned our driver by phone and sank exhausted into the back or our hire car. We were home before 2pm. It was the third wedding we’d been to since coming to China, and perhaps the most memorable. 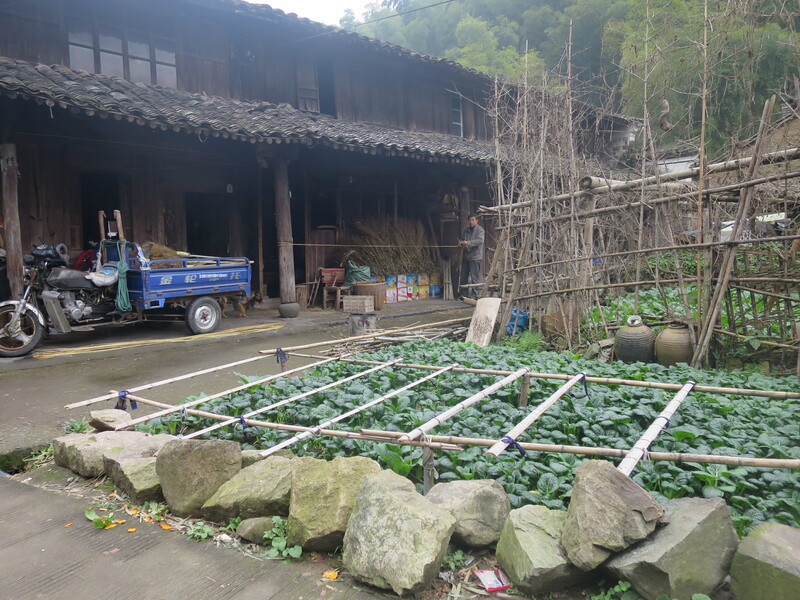 The rural setting made the contrasts between old and new China especially stark and once again underlined the extraordinary personal journeys of change undertaken within one or two generations.